During communion, I saw three things being torn and separated to give us entrance into His presence. 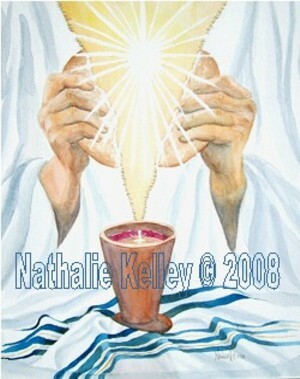 On the night of the Passover Feast, Jesus took the bread and said, “This is my body..” and He broke the bread. Hebrew speaks of the veil of His flesh which was torn when He was beaten before the crucifixion. The veil of the temple was torn from the top to the bottom when Jesus died. I believe that God desires for us to come into His presence and the way has been opened for us. The blue stripes of the prayer tallit represent the washing with pure water.